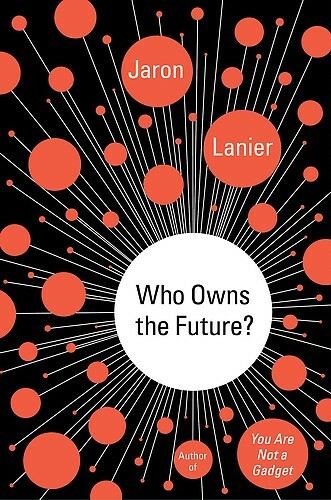 Jaron Lanier, “Who Owns the Future?” 2013. [forthcoming at London School of Economics’ Impact of Social Sciences]. Fair enough, this sounds admirable, and who would really disagree? Neylon’s concept of ‘Open’ is plausible, even inspiring; I see where he’s coming from, I see how it supports the policy objectives advocated by him and his employer Public Library of Science, for example CC-BY licensing; and so on. “Open” is those practices which facilitate the most people having the most freedom and agency to live according to their values. or even, not people, just scholars. Different ideas, afar from the usual discussions of say “Open Access,” but nonetheless say I have them. Perhaps they even make more sense to a lot of people globally, who may be living, not a stable and advanced country like the UK with well-functioning social institutions, but in a precarious, informal economy and underclass, a struggling knowledge worker in some barbaric environment of violent class warfare and no safety net like, say, Silicon Valley. Unfortunately, this view might rather conflict with Neylon’s idea of scholarly openness. While he says he’s rising above definitions to describe a state of mind, that state clearly implies support for the universal-reuse definition of open access associated with the BOAI declaration and CC-BY licensing, which Neylon and associated organizations strongly advocate. Now what? As the Apollo 13 crew-member said: Houston, we have a problem. I would suggest, doesn’t the spirit of humility Neylon speaks of, the receptivity to others’ ideas and contributions, apply to one’s thinking about ‘open’ or ‘open access’ as well? In other words, if you have an open state of mind, you have not “a particular type of humility” (Neylon) but in fact broad humility. To accept, for example, that other may develop concepts of ‘open’ or ‘Open Access’ that may, for example, reject the “reuse” priority and favor other values such as universal participation, scholars’ ability to receive adequate funding to work, etc. ‘Open’ is what can’t be fully defined; it’s the capacity to resist single or final definition, and accept all understanding as provisional and evolving. I believe it’s an extremely difficult “state of mind” to even approach, because we are continually beset and enclosed by cognitive biases, habits, routines, engagements and institutions which precisely oppose the state of real openness that holds every definition as provisional, every configuration as potentially fluid. it struck me what quality went to form a Man of Achievement… I mean Negative Capability, that is, when a man is capable of being in uncertainties, mysteries, doubts, without any irritable reaching after fact and reason. Wikipedia summarizes the idea as “the capacity of human beings to transcend and revise their contexts.” It’s a type of radical openness, defined with a paradoxical term. So perhaps ‘open’ or ‘open access’ are terms one can’t and shouldn’t attempt to finally define, at least not any longer, now that they are part of human history. To be truly open, one must say, ‘open’ means this to me, but I accept that my understanding is provisional, that it may not be everybody’s. Taking another perspective entirely, I’d note that in locating and presenting the Nietzsche quote above, and showing it in the context of the original text, I used Google Book Search, as I do many times every day. Google Book Search, however, fails just about every notion of “open” that Neylon puts forward, as it is definitely not given for unrestricted use, and is done by a public for-profit corporation with clear self-interested and profit motives for the work. But nonetheless, this non-open economic structure is delivering this hugely valuable, open economic good, which does exactly what I want done, for free, and offers the same to any Web user on the planet. Is Google ‘open’, do the leaders of the company and this product have an “open state of mind”? It’s clearly a complex question, and you can in your nearest bookstore pick up current best-sellers with completely different opinions on that, e.g. The New Digital Age from Google chairman Eric Schmidt and Google Ideas director Jared Cohen, versus Who Owns the Future? by Jaron Lanier. Should we accept a specific definition of “open” that would exclude Google Book Search, or for example any other type of mixed/versioned, self-sustaining economic model like OECD‘s publishing program or Unglue.it or OpenEdition or DeepDyve? No, that would probably be narrow and short-sighted; it would deprecate and misunderstand and exclude innovators in related fields. Open is a state of mind that resists or holds provisional all final or single definitions, because our understanding is always changing and evolving. This is being open to others, to our evolving selves and circumstances, to other views, and to the future, in the difficult, radical, and necessary way that we must. Let me know what you think, or follow me, via comments box below, at Twitter @tmccormick, or by email to tmccormick at gmail, or by RSS or anonymous form on my Contact page.